80 Years of the Traction Avant - Video Tribute - CITROËNVIE !CITROËNVIE ! 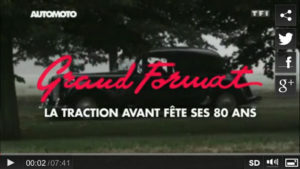 TF1 (French Television) ran a tribute to the Traction Avant last Sunday in honour of its 80th anniversary. While they cover the big event held at La Ferté-Vidamme, France on Sept. 13 and 14 of this year, they also visit François-Xavier Despret, an avid Traction (with over 20 various types) and feature Andre Midol who took his 15-6 carbio on some of the worst roads in South America, Africa, Iran, and other places. It’s a very well produced video of our favorite car.